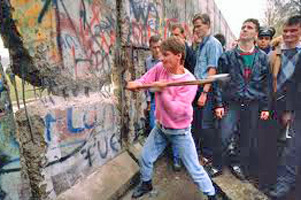 The Colin web site (www.jeanclaudecolin.org) is hosted from Australia. 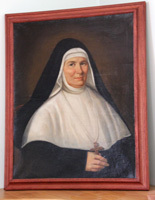 Jun 30 marks one hundred and fifty-six years since the death at Jarnosse, France, in 1858 of Marist Sisters' Foundress, Jeanne-Marie Chavoin, an anniversary remembered by Marists throughout the world. 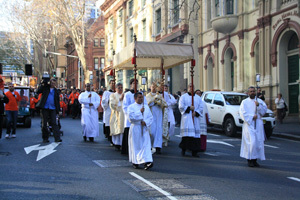 Once again Sydney's diverse Catholic community participated in this year's Corpus Christi procession from St Patrick's, Church Hill, to St Mary's cathedral on Jun 22. 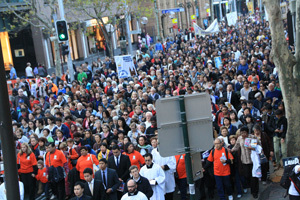 Leaving the Marist Eucharistic shrine the procession was led by Apostolic Adminstrator, Bishop Peter Comensoli, accompanied by Bishop Terry Brady, priests and seminarians and several thousand of Catholics, young and old, reflecting the ehnic richness of the local Church. The annual meeting of Marist leadership in Asia-Pacific (MAP) is being held in Davao on the island of Mindanao, Philippines, Jun 17-19. Provincial and Mission District leaders are reviewing and planning for ways of further collaborating in ministry throughout the four units represented in Asia-Pacific: Australia, New Zealand, Philippines and Oceania. Topics include formation, recruitment and other areas of ministry collaboration and support. Australia is represented by provincial, Frs Bob Barber, and vicar-provincial, Peter McMurrich,and the international leadership team by Fr Larry Duffy (General Administration, Rome). 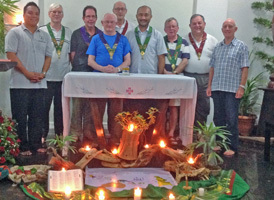 Other participants include Frs Pat Devlin (district superior, Asia), Ben McKenna (Provincial, Oceania), Pio Fong (Oceania), David Kennerley (provincial, NZ) and Neil Vaney (NZ). From left: Frs Bob Barber, David Kennerley, Peter McMurrich, Neil Vaney, Larry Duffy, Ben McKenna, Pio Fong and Pat Devlin. 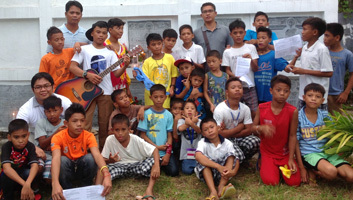 Marist Fathers and Laity in Mindanao, southern Philippines, paused on Jun 15 to honour the memory of Fr Philip Callaghan SM. 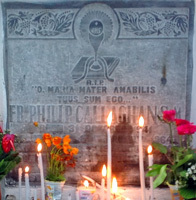 In a ceremony in the cemetery of Davao City a group gathered in prayer and song at Fr Phil's grave. 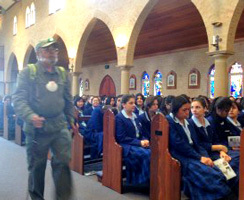 They included local and visiting Marists and grateful ex-students of the Birsbane-born missionary who died in 2005. 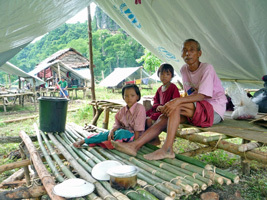 Jun 15-22: Go to Refugee Council of Australia and Refugee Week. 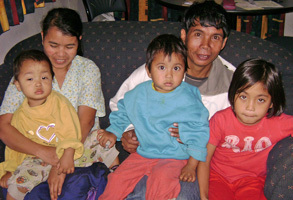 The Society of Mary has a long involvement with refugees. Australian Secretary-General of the Society of Mary, Fr Tony Corcoran, is part of the Fourvière Bicentenary Committee preparing for a combined Marist celebration of the bicentenary of the Fourvière pledge in 1816. 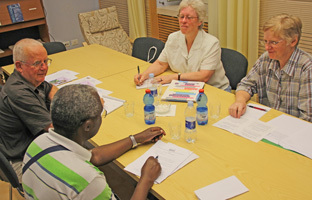 Holding its second meeting in Rome on Jun 12, the committee reports: "Preparations are proceeding well — the venue for Jul 23, 2016, the Basilica in Lyons has been booked, and a number of publications and activities have been planned to assist local communities in marking the year." The Society of Mary's Australian province has received books written by two Marists who have died in recent years. Fr Barry Miller's 'From Existence to God' has been translated into Italian as ''Dall' esistenza a Dio', recently published in Italy by Carocci Editore. 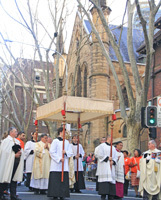 The substance of the book was developed in Fr Barry's years as a philosophy teacher of Marist seminarians in Australia. Sr Gail Reneker SM welcoming the Sisters and friends to the jubilee Mass in the chapel of the Marist Sisters College, Woolwich. 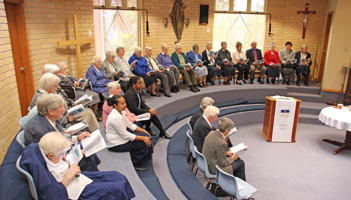 One hundred and thirty years of religious life lived by two Marist Sisters was celebrated on Pentecost Sunday at Woolwich, NSW. The jubilarians are Sr Gabriel Forster SM (70 years) and Sr Patricia Bartley SM (60 years). 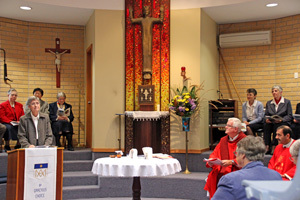 Frs Paul Mahony SM and Chris Sarkis (Rosemeadow) concelebrated the Eucharist attended by Sydney-based Marist Sisters, family and friends of the jubilarians. Congratulations Sr Gabriel and Sr Patricia! Council of the Province members receiving reports from business managers (from left): Frs Bob Barber, Tony Kennedy (chairperson), Michael Whelan, Gerard Hall, Kevin Bates and Peter McMurrich, Tony and Andrew Biddle, Frs Kevin Stewart, Ray Chapman, Bernard McFadyen, Ron Nissen, Jim Carty and Paul Sullivan. 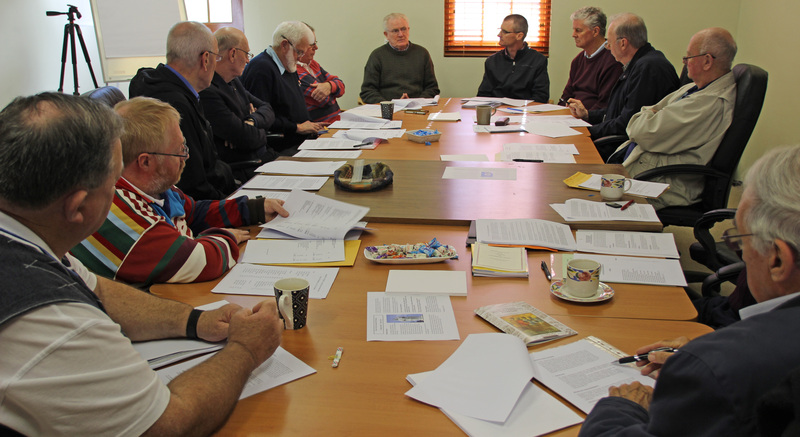 Meeting at the provincial headquarters of the Society of Mary's Australian province, Hunters Hill, on Jun 07, the Council of the Province made its customary review of the life of the province since the last chapter in 2012. Matters considered by the Council included prioritisation of ministries, financial reports, ageing, formation, vocations and holiday residences. Recalling the day of death (Jun 06) in 1840 of Marcellin Champagnat, we join the whole Marist Family in wishing "Happy Feast Day!" to our Marist Brothers throughout the world. As well as founding the Marist Brothers, Fr Marcellin Champagnat was one of the first group of Marist priests to make profession at Belley, France, on Sep 24, 1836, and a lifelong friend of Ven Jean-Claude Colin SM. 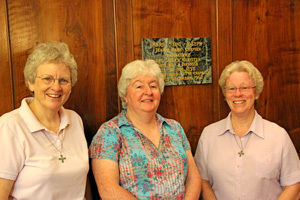 Laity from the several Marist family branches gathered at St Patrick's, Church Hill, Sydney, on May 31 to reflect on the charism of their individual founders/foundresses. 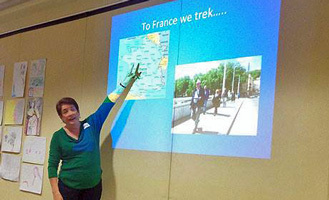 Also featured was a pictorial presentation from co-leader of Marist Laity Australia, Margaret Wood, of the recent pilgrimage to Marist places of interest in France and Rome. 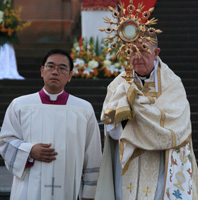 The Eucharist was celebrated with Fr Willy Melteras SM with images of the Marist founders nearby.